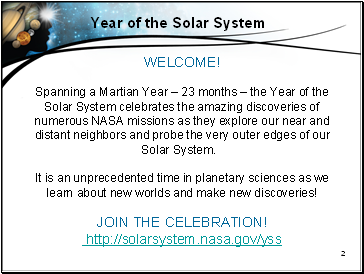 Spanning a Martian Year – 23 months – the Year of the Solar System celebrates the amazing discoveries of numerous NASA missions as they explore our near and distant neighbors and probe the very outer edges of our Solar System. 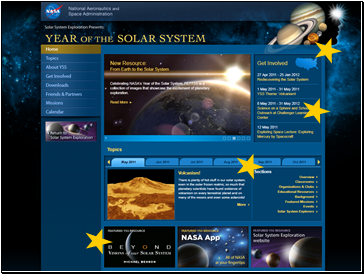 It is an unprecedented time in planetary sciences as we learn about new worlds and make new discoveries! 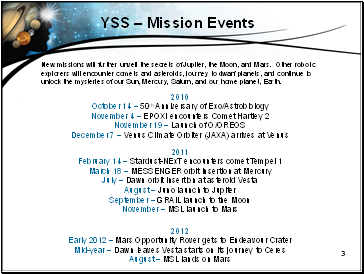 New missions will further unveil the secrets of Jupiter, the Moon, and Mars. 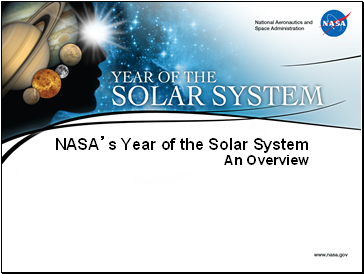 Other robotic explorers will encounter comets and asteroids, journey to dwarf planets, and continue to unlock the mysteries of our Sun, Mercury, Saturn, and our home planet, Earth. 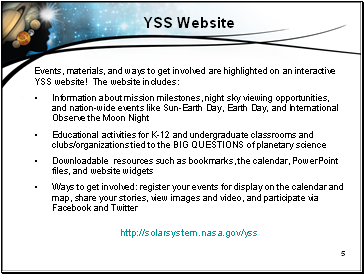 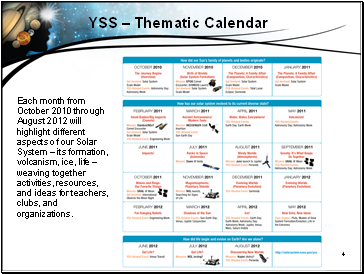 Each month from October 2010 through August 2012 will highlight different aspects of our Solar System – its formation, volcanism, ice, life – weaving together activities, resources, and ideas for teachers, clubs, and organizations.